Ink & watercolor in 9×12 Aquabee Sketchbook (Lamy Safari pen, Noodlers Ink). 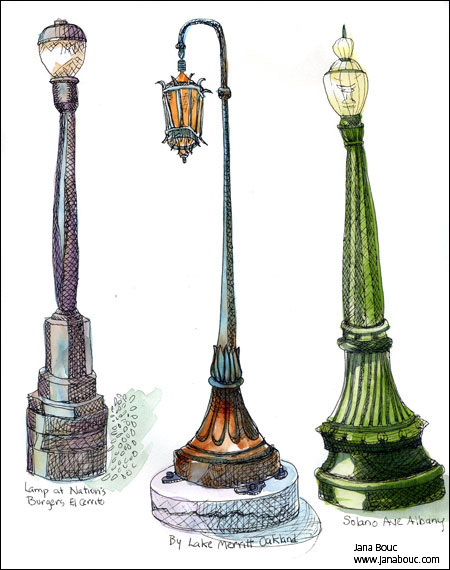 Last week’s Everyday Matters challenge was to draw streetlights. The one on the left is on the corner of Carlson by Nation’s Burgers in El Cerrito. I spotted the middle one while taking a lunch-break walk along Lake Merritt in Oakland. The lamp on the right is on the Albany end of Solano Ave. I drew the one below in my little Moleskine sketchbook with a Micron Pigma this morning while I was on the elevated platform at the BART station waiting for the train. It was right at eye level. JANA!! These are STUNNING!!! HOLY MOLY! The colors! The Lines! The form! I LOVE THEm!!! So individual, so different – charming charming charming lights – but your rendering is so warm and inviting and delicious!!!! I LOVE the fine line detailing work …shading — all of it !!! FANTASTIC JOB! BTW, do I see a ‘face’ in the green lamp?? I hope you get some sleep, cara … my cat, when she was alive, used to keep me up nights just cuddling … her whiskers would tickle my nose and I would awake and not get back to sleep for hours. Your book sounds very interesting!!! Great work Jana!! I really love the intricacy of the one in the center and the foreshortening of the bottom one! Lovely work! As per your usual…GREAT job….I think i need to do that one I took a pic of in Charleston..
San Francisco has great street lights! (But it’s definitely a city that takes care of its heritage, isn’t it?) You’ve captured them well. Gorgeous stree lights! For real and your rendition! Ours are so boring I am not even going to do this challenge, well, until I find some good ones. A wonderland of streetlights – great job with all your rendering. I like how these look like urban botanical drawings and how this particular series makes me look at things differently. Yay for you Jana! Jana! These streetlights are incredible. I love them! I am new to your blog and am now a big fan of your drawings. Keep up the great work! I’ll be back. I love that the bases of the streetlights are as interesting and varied as the lamps! I watched “Streetlights (Everyday Matters #81)”. It is a very wonderful picture. Now I understand “Everyday Matters”. participate. Please teach the participation method.